The Forgemaster is a powerful Dwarven Centurion that guards the Aetherium Forge. The Forgemaster is slightly larger in size than normal Centurions, still appearing partially molten due to its long slumber in the lava, and breathes a gout of fire instead of steam. It has a minimum level of 24, so lower level characters will want to take extra care - though this is quite hard with both its ranged and melee attack being quite strong. The fire it breathes will also linger on the ground for some time, causing low-medium fire damage. 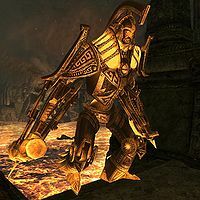 If you have a follower with you, it is highly advisable to allow them to attack first - as the difficulty in killing The Forgemaster is much lower if its attention is elsewhere. If you have a melee follower, they may rush The Forgemaster before it leaves the lava - killing your follower almost instantly. If you have a high Archery skill, it is possible to sneak attack The Forgemaster before it steps out of the lava, causing it to fall backwards into the lava. Unlike other Dwarven Automatons, The Forgemaster can be hurt by frost destruction spells. This page was last modified on 19 November 2018, at 18:45.